This potato recipe is taken to flavoursome heights with the presence of inspiring flavours including apple cider marinade and rosemary which beautifully seasons the skins of the spuds! Tuck into the method below! If you have time, marinate the pork chops for a few hours in the cider. This helps tenderise them and give them plenty of flavour. If not, half an hour will do. Bring a pan of water to the boil and parboil the potatoes for 4 minutes. Drain. Heat a sauté pan with a little oil. Drain, reserving the marinade, and pat dry the pork. Cook for six minutes each side, remove from the pan and put on a tray in the oven while you make the potatoes and sauce. Add the potatoes to the sauté pan, season well and add the rosemary and apple. Meanwhile, gently cook the onion in a little oil until soft, turn up the heat and pour in a good splash of the cider marinade. Reduce by half, turn the heat down, season then stir in the cream and mustard and heat until bubbling. 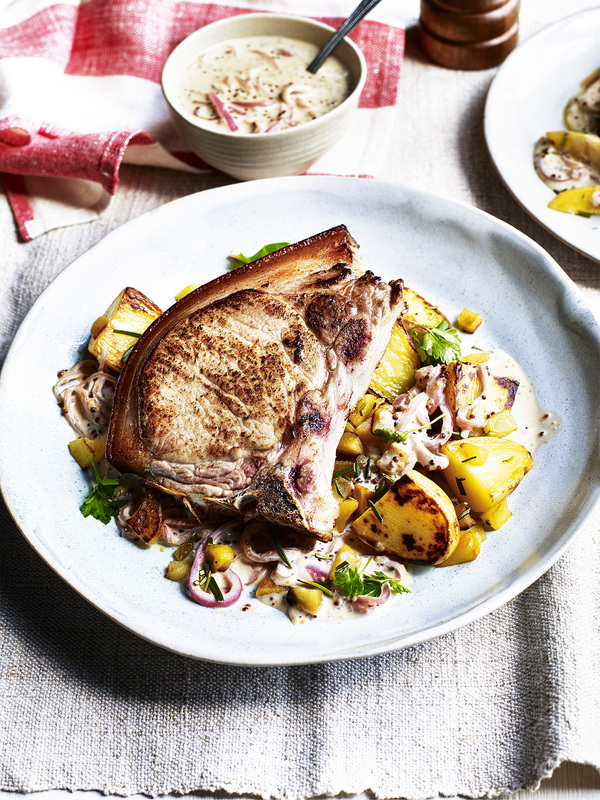 Serve the pork on top of the potatoes and with a good amount of the mustard sauce. Sizzle up your week with this Chinese pepper steak & potato stir fry. Quick, easy and packed full of colour and authentic flavour, discover how to create the ultimate potato stir-fry in just 30 minutes! An easy dish to make taking just 10 minutes to prep, this casserole is healthy and nutritious containing potatoes, sausages and peppers. Giving a Jamaican twist on a classic potato cake recipe helps gives this recipe a bit of a kick for spice lovers! This simple recipe is ideal to impress your guests with this delicious herby cod dish, which is ready in under half an hour! Quick and easily done, just in time for dinner.